In 1872, the Prince of Wales opened the Bethnal Green Museum, a branch of the Victoria and Albert Museum (V&A), later renamed The Museum of Childhood. Bethnal Green was, and largely remains, a ‘deprived’ area of London. Victorian middle-class social reformers considered that the ‘lower orders’ should enrich their minds with ‘rational recreation’. Visiting museums and galleries was thought much more life-enhancing than drinking and gambling. Prince Albert helped to further the cause of ‘rational recreation’ by founding museums in South Kensington. Profits from the Great Exhibition of the Works of Industry of all Nations, held in the specially built Crystal Palace in Hyde Park in 1851, helped to fund these projects. Opportunities for ‘rational recreation’ were encouraged throughout the capital. Local figures in Bethnal Green embraced the idea. Indeed, in 1851, William Gladstone, later prime minister, had suggested that a museum be built in the area. Prominent local people purchased common land for this purpose, but had to wait to realize their goal. Though the museum had a mission – to broaden cultural awareness in the community – it didn’t have a focus. It housed collections from the Great Exhibition, such as those exploring the nature and sources of food, and from the V&A, and French art on loan from Sir Richard Wallace (of the Wallace Collection). Other exhibits showed aspects of the local trades of weaving and furniture making. Evening opening hours lured people away from the public houses. In 1922 Arthur Sabin, then head curator, began the evolution of the museum into one devoted to the world of childhood. He wanted to engage the attention of many seemingly uninterested visiting children. Recalling children’s enthusiasm several years previously at a temporary V&A exhibition of toys, including dolls’ houses and a model of a Japanese palace, Sabin determined to build up the museum’s collection of children’s artefacts. Queen Mary, the wife of George V, and Mary Greg, widow of cotton manufacturer Thomas Tylston Greg, were especially helpful benefactors. Queen Mary, a great collector of toys and miniatures, shared Sabin’s view that children should enjoy visiting museums. She gave some 50 dolls’ houses and rooms to various institutions such as hospitals and museums. One of her most special gifts to the Museum was a dolls’ house made by a firm that specialized in making billiard tables. Queen Mary supervised the furnishing and interiors of the house so that it would be in the style of 1921. She had bought the house from The Royal School of Needlework, where it had been on exhibition. Another treasured donation was a two-room house known as Queen Mary’s Rooms. David Allan, a tapissier to the King, created the rooms. Mary Greg valued traditional artisan skills, as she was particularly interested in pre-industrial handmade objects. She collected small objects, such as dolls’ houses, miniature room settings and furniture, and dolls, and also donated many of her treasures to museums such as the Manchester Art Gallery and the Geffrye Museum. The dolls’ house collection grew to around one hundred examples. During the Second World War and until 1950, the building served as a public canteen. When the museum reopened, exhibits from the V&A’s collection were displayed as well as a small collection of childhood-related objects, which became increasingly popular attractions. In light of this, Roy Strong, appointed director of the V&A in 1973, relaunched the museum as one dedicated to the world of childhood. All the V&A’s childhood-related collections were transferred to Bethnal Green. Donations from toy companies, the BBC and individuals, and government funding have enabled the collections to expand and the museum to undergo refurbishment and remodelling. In 2013, the Museum attracted over 400,000 visitors. The current main exhibition, Small Stories: At Home in a Dolls’ House (until 6 September 2015), is a fascinating tribute to some of the original dolls’ houses in the Museum’s collections. Twelve dolls’ houses from the past 300 years are displayed chronologically, and include some 1,900 miniature objects and 107 dolls. The houses come to life at the touch of a button, with recordings of imaginary people who are likely to have lived or worked in the houses or room sets, and the characters ‘light up’. One man, Dr Killer, had commissioned a copy of one of his favourite cabinets for his daughter, Frances. Betsy, a servant in the Killer Cabinet ‘House’, reveals that she’s taken to ‘sprinkling the carpets with tea leaves before I do the daily sweep; it does a grand job of settling the dust and lends a fragrant smell.’ She uses bread to wipe off surface dirt on the wallpaper. (This tip is still recommended today.) British dolls’ houses were usually miniature buildings, so the cabinet, as a dolls’ house, is unusual. It is made of lacquered wood and decorated with Chinese scenes, flora and fauna depicted in gold on black. Mrs Killer and her daughter made the dolls and furnishings, which date from the 1830s and 1840s. The wallpapers are thought to be offcuts used to decorate the Killers’ home. Moray, of Whiteladies House, makes one think of Noel Coward when she says ‘Come and join the cult of sunlight, darling…Everybody’s here. Stanley’s mixing gin cocktails…Bobby’s sunbathing on the roof. Max downstairs has just arrived from Germany. He has wonderful ideas about rational design.’ The cream coloured house – large, flat roofed and geometric – has a swimming pool with a diving board, a tennis court, and hedges and flowers. Whiteladies was designed by Mrs Moray Thomas and built in 1935 by William Purse, a chauffeur and carpenter. It has pipe cleaner inhabitants. The artist Claude Flight painted some of the stunning murals. The house was publicly displayed in order to raise funds for the Middlesex Hospital. The artist Laurie Simmons and architect Peter Wheelwright designed the award-winning house in 2000 for Bozart Toys, an American toy company that commissions ‘quality artists to create toys’. The house dazzles with its interchangeable Perspex sliding walls and bright red chimneystack. The family living space is a double height room with a gallery. Ron Arad and Dakota Jackson designed some of the furniture. Artists such as Cindy Sherman and Mel Kendrick have contributed artwork. As Simmons and Wheelwright say, the house was intended to be an ‘interactive play environment for children six years old and above’. Simmons was inspired by the Stettheimer, a legendary dolls’ house at the Museum of the City of New York, which has tiny artworks by artists such as Alexander Archipenko, Marcel Duchamp, and Gaston Lachaise. For the grand finale, you’ll appreciate Dream House, a recently commissioned miniature house of 19 rooms, each designed by a contemporary artist. I was charmed by the library created by Emma Mawston and Keighley Shepherdly of Liberty, which has scaled down Liberty fabrics and a rug embroidered by the students of the Royal School of Needlework. You can see more dolls’ houses in the Museum’s collection as you stroll through the floors. By looking at these domestic treasures we learn about aspects of life, past and present – architecture, interior design, fine art, social values and customs, housekeeping and cooking, burgeoning trade. Facts about how we’ve kept clean and healthy come to the fore. The constructions are silent sources of information. What we see at the Museum proves that we must never put away childish things. The material of childhood is not only captivating but a continuing influence upon our nature and outlook. I saw as many adults enjoying the exhibits as children; and one couldn’t suggest that the dolls’ houses exhibition was gender or age related. People of all ages were donning the headphones and pressing the buttons to light up the rooms – to spark the sense of wonder that’s the gold dust of childhood. Dolls’ houses originated in American and European culture, though there’s evidence of furnished miniature structures used for funerary or votive purposes in ancient Egypt. Modern dolls’ houses date from the 16th century, some being referred to as ‘baby’ houses. Initially, many were designed to hold collections of precious miniatures (in cabinets) or as near replicas of wealthy homes, reflecting the owners’ status and wealth. Many were valued as visual aids for young women hoping to become wives and mothers. Their interiors revealed how a prosperous, respected household should be organized and managed. In the late 18th century dolls’ houses started to be created specifically for children to enjoy. While earlier ones were finely crafted and endowed, industrialization enabled more homely structures to be produced; no longer were dolls’ houses elite objects. Artisans such as Thomas Chippendale; architects, notably Edwin Lutyens; artists such as Roger Fry; and writers such as Rudyard Kipling have been involved in their creation. Two famous quite phantasmagorical houses are Sir Neville Wilkinson’s Titania’s Palace and film star Colleen Moore’s Fairy Castle. For information about the museum’s opening hours and facilities, please visit http://www.vam.ac.uk/moc/home/. 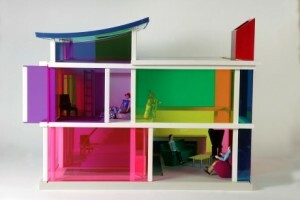 The photograph is of Kaleidoscope House, designed by Laurie Simmons and Peter Wheelwright and Bozart, USA, 2001. © Victoria and Albert Museum, London. This article first appeared in Cassone: The International Online Magazine of Art and Art Books in the February 2015 issue.